A presence on the web can help companies to develop and make themselves known in the market. If you believe the statistics, it is indispensable to their survival: according to a study by the company Email-Broker, 81% of companies that went bankrupt in 2013 were not on the internet … These data probably convince some entrepreneurs of importance of creating a website, but how to do it? This article will help you to start your digital project by presenting you some tools of creation of website. With millions of registered websites, it is not easy to find a free domain name. Name Mesh includes in its database more than 6 million words to help you find a perfect mix. 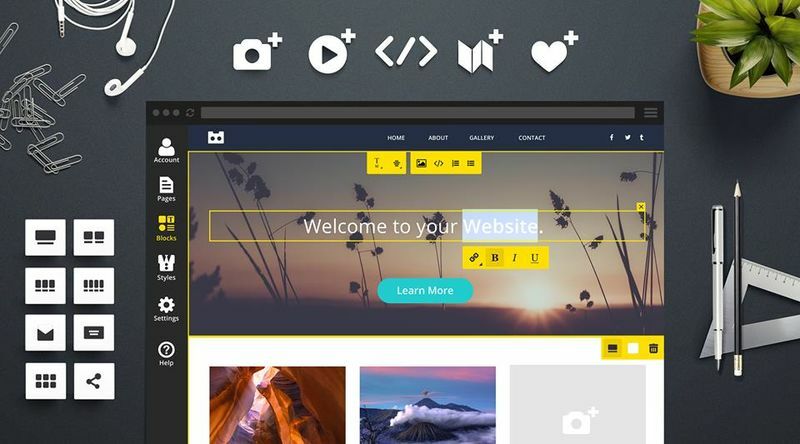 MockFlow allows you to create wireframes for websites and software. Very easy to use, this tool will be perfect for beginners in web development. Indeed, the software offers components of predefined websites. All you have to do is slide them down and place them where you want them. You will need a few minutes to create a wireframe. Do not neglect this stage of website creation: it is important to define the structure of the site and the organization of all its contents before moving on to other elements of the webdesign, such as typography and colors. Once all the content is organized, you can look at the more decorative aspects of webdesign. Typecast makes it easy to choose typography and make the layout of your website, as in a text editor like Microsoft Word. It contains 5,000 fonts that you can compare before choosing the one you want. All changes can be viewed directly on the website. The tool also provides the CSS code of all fonts for use on any website. You then have the guarantee that the users will see the same results as you. Adobe Kuler is an ideal tool for creating harmonious color palettes. In addition, you will have access to themes already created by members of the Adobe Kuler community. Prototyping is the most important step in any digital project. This is the model that will be used to develop it to encode the website. Invision allows you to transform your drawings into interactive prototypes. It also gives the possibility to share a project with other people. Perfect for working as a team or presenting the design to the customer. We have already presented a prototyping tool, but Proto.io also deserves its place on this list. This tool is especially suitable for creating mobile applications, including web applications. Like MockFlow, it contains predefined elements, such as buttons, forms, text, and menus. It also offers an HTML editor for those who would like to make some changes. If you intend to start your business, the creation of website will not suffice. You will need to work, more generally, all the visual aspect of your brand. Squarespace Logo makes it easy to create a logo that you can then download in PNG format. Do you feel discouraged by the first seven steps of creating a website? Templated will have something to please you. It is a library of templates in HTML and CSS3 ready to use. The download is unlimited, and you can even use it commercially. Go take a look – the models have a professional look, and they are all mobile friendly. If, on the contrary, you want to deepen the subject and introduce you to web development, we advise you to have a look at Sublime Text. It is a developer text editor that supports 44 programming languages. You will be surprised by the simplicity of its interface. Creating a professional website requires a lot of work and time. Even if you decide to hire a web developer to carry out your project, it will need to see your complete specifications before doing anything. The colors, the typography, the contents, the keywords – all these elements can be defined only by the creator of the web site, that is to say you.